This past week, I have been getting in touch with old high school classmates and mentally preparing myself for my birthday. I reflected a little on my adolescence, and the old memories made me laugh, cry, cringe, and smile. I left high school with sweet memories and learning experiences that I will hang on to for as long as my long-term autobiographical memory will allow. One of my fondest experiences was “studying” with my Physiology group. We’d get together in the evenings and open our books to study for 5 minutes or so, then play Taboo for the rest of the night. I am pretty sure all of our parents disapproved. After several hours of laughing until our stomachs hurt, we’d hop in the car and grab a quick bite. I always hoped the majority would end up voting for Las Vegas Taqueria in Milpitas, which in my opinion, was one of the best eateries in town. They served the most outrageous carne asada fries, which were covered in large mounds of cheese, guacamole, and sour cream. 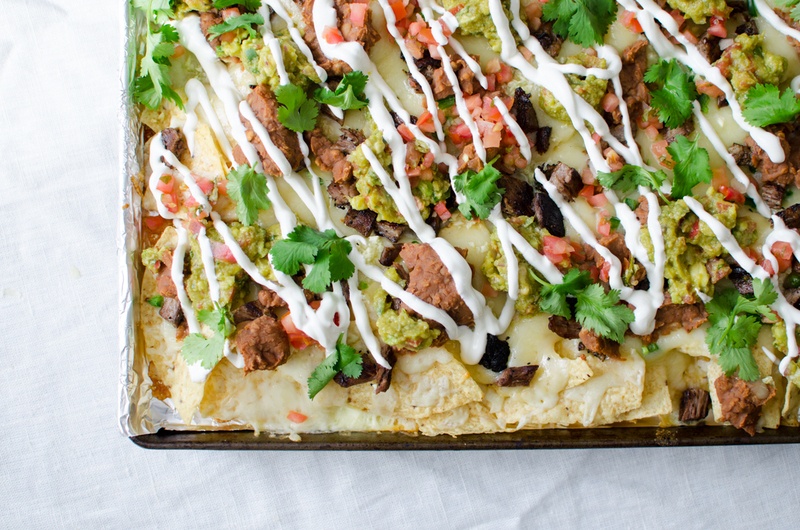 I got the idea to make *birthday* carne asada nachos from Judy Haubert, who coined the term “birthday nachos”. What makes them birthday nachos? Well the fact that I’m making them for my birthday. 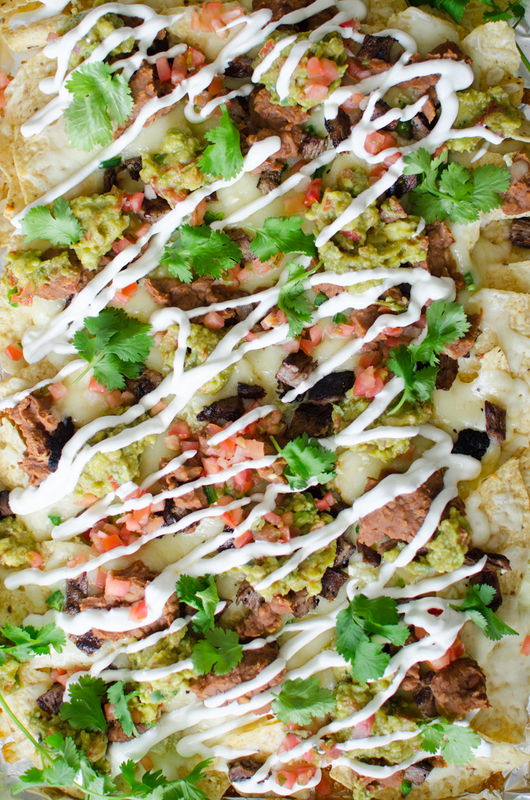 In the spirit of LV Taqueria, I loaded these nachos with carne asada (which was heavily adapted from Tyler Florence’s recipe), refried pinto beans, fresh guacamole, pico de gallo, sour cream, and freshly grated Monterey Jack cheese. Avoid using pre-shredded cheese if possible! 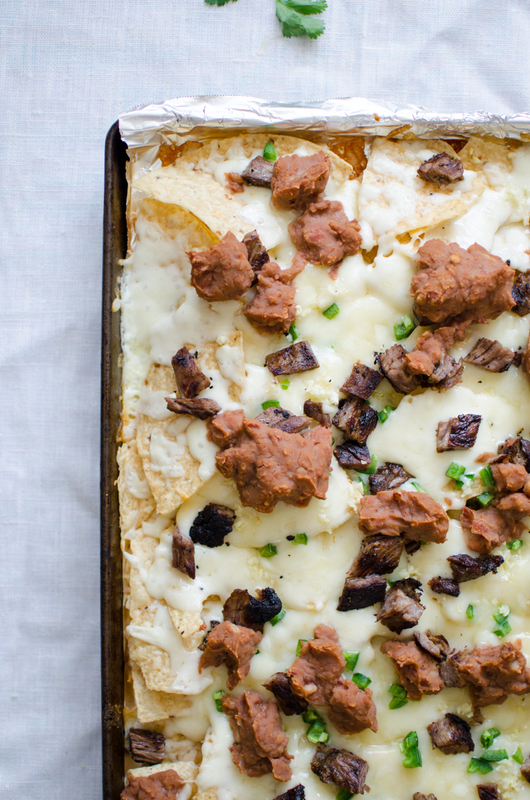 The stabilizers in pre-shredded cheese won’t make for good nachos. 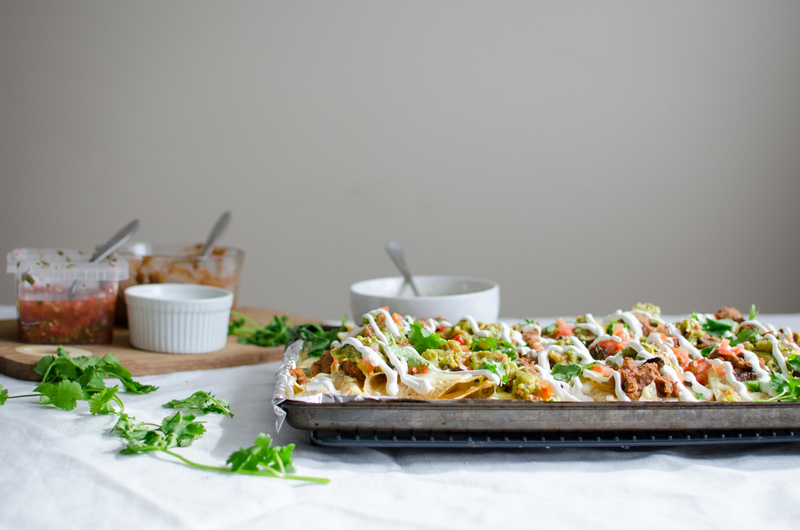 I also topped these nachos with diced jalapenos and minced garlic before baking to make them even more special. 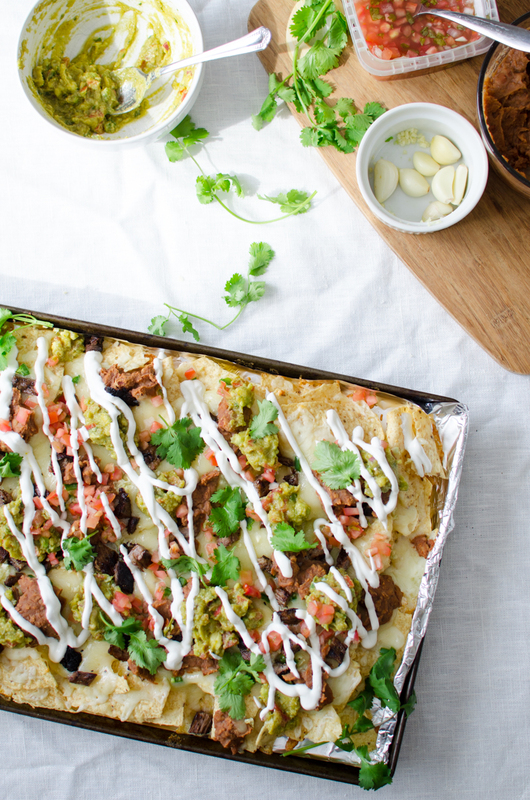 And of course, these nachos should be served immediately and with lots and lots of fresh cilantro. 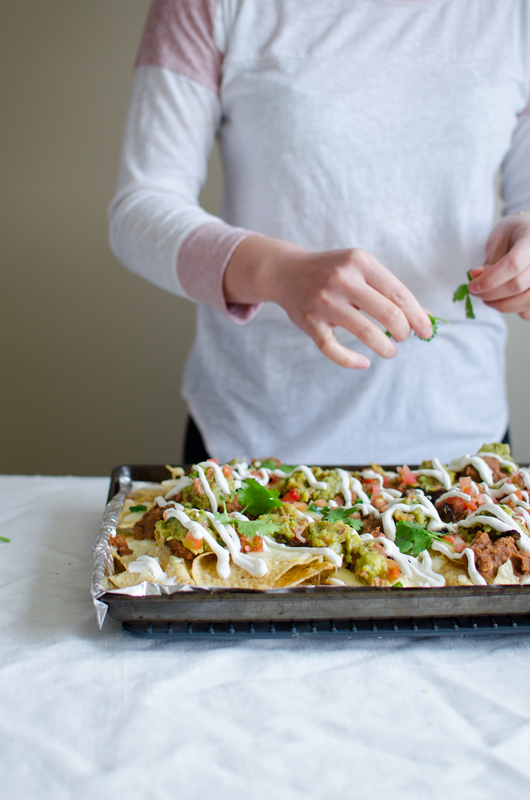 While snacking on these birthday nachos, I came up with some goals for the year: 1) start saving for retirement 2) drink less milk tea 3) reduce kitchen-related injuries 4) buy a stand mixer. Let us raise our tortilla chips to another wonderful year! To make the marinade, blend all the ingredients, except the steak of course, with a blender on high power for 2 minutes. Place the steak in a large ziplock bag and pour in the marinade. Marinade for 1 to 2 hours. Grill or broil the steak for 6-8 minutes on each side over medium-high heat (don't move the steak around once you have placed it on the hot surface, and only flip once). 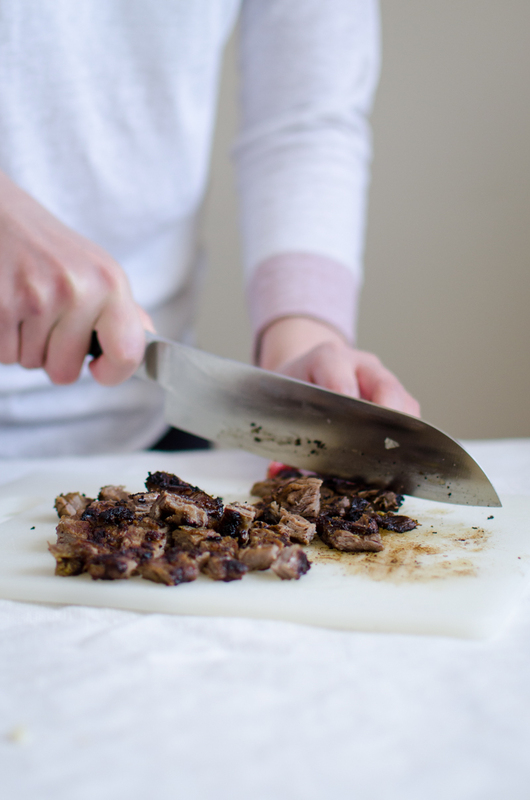 Remove from the heat, allow it to cool, then slice into small bite-size pieces. 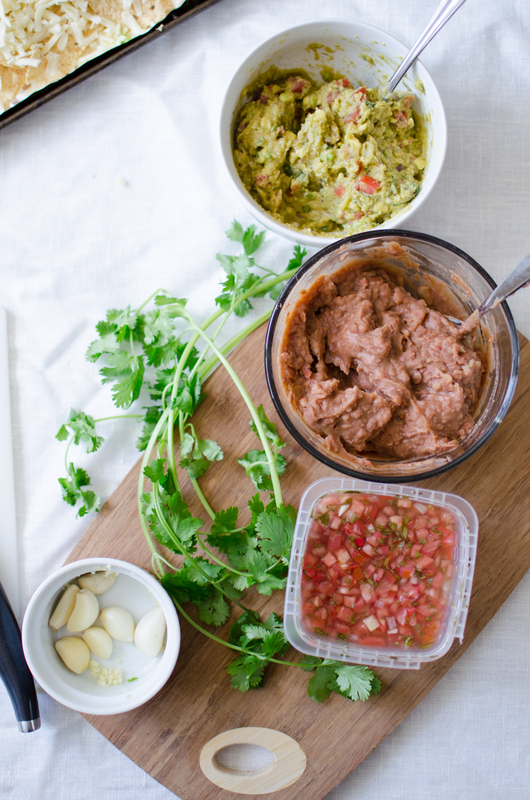 Scoop the refried beans into a microwave safe bowl, and microwave on high for 2-3 minutes, or until warmed through. Line a large baking sheet with foil. 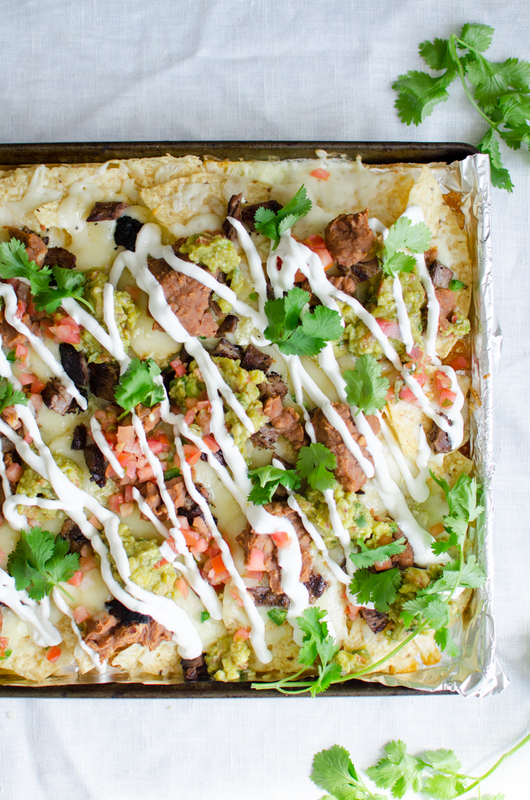 Spread the tortilla chips on the sheet. Sprinkle the cheese over the chips, then add the garlic and jalapeno. 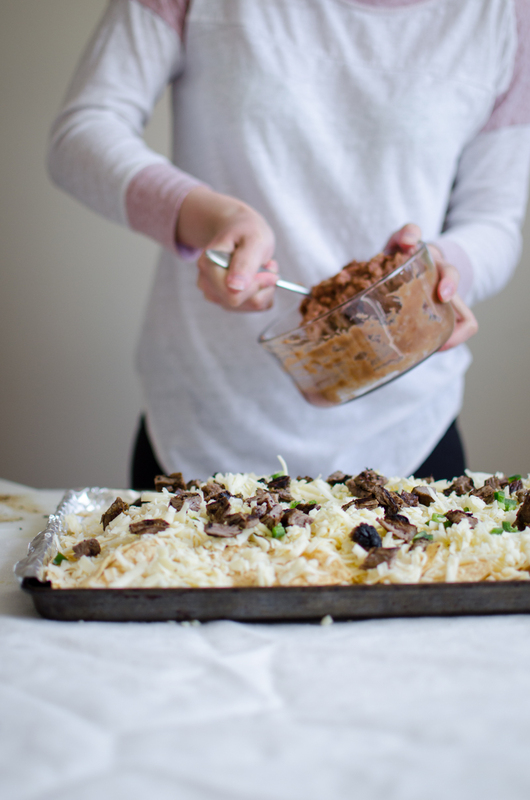 Scoop little mounds of refried beans over the cheese, then top with diced steak. 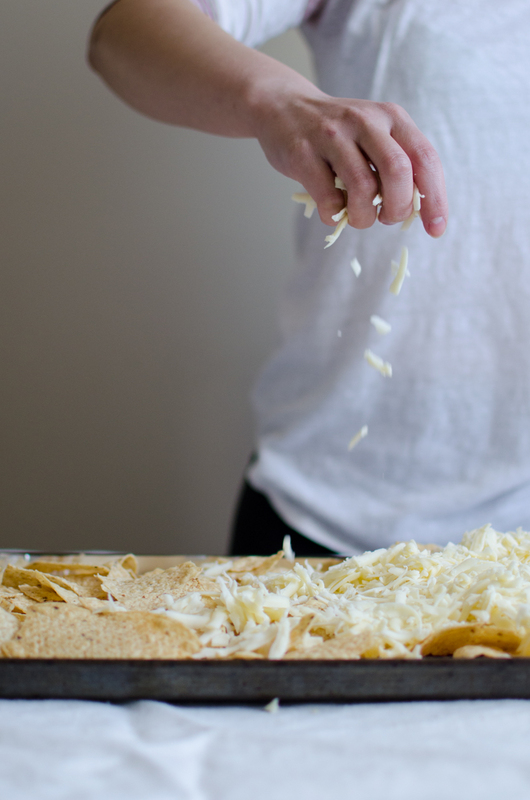 Bake in the oven for 10 minutes, or until all the cheese is melted. 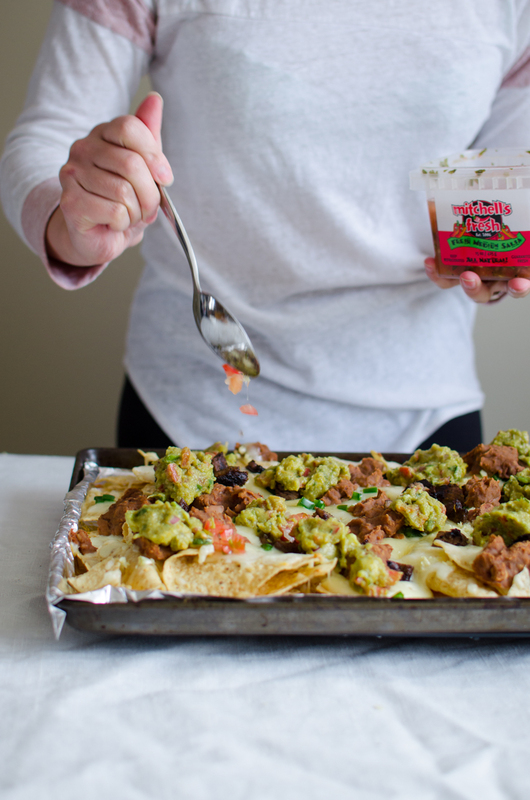 Top the nachos with little mounds of guacamole and pico de gallo. Scoop ⅓ cup sour cream into a medium ziplock bag, the snip off one corner. 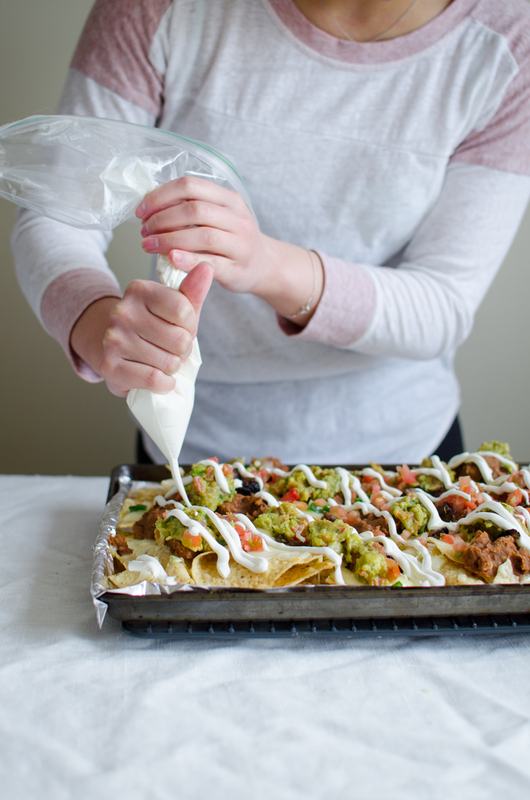 Pipe the sour cream over the nachos. Sprinkle cilantro over the top and serve immediately with the extra guacamole on the side. 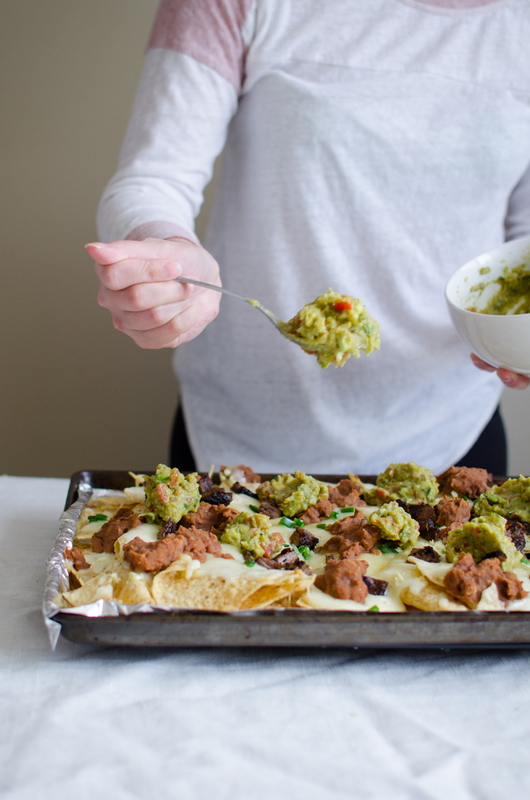 This entry was posted in Appetizers and tagged cilantro, garlic, guacamole, jalapeno, nachos, pico de gallo, refried beans, sour cream, steak, tortilla chips.